Here you can find Sample Scripts created with Auto Mouse Click Software. You can also Watch Video Tutorials and Quickly Learn All the Features of Auto Mouse Click Software. All the Video Tutorials are Packaged as .wmv files which can be played in Windows Media Player. 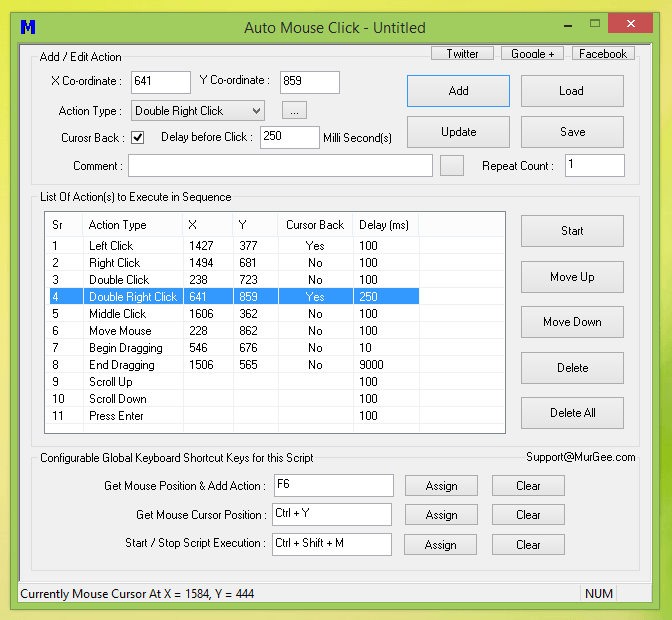 In case you do have different version installed on your Windows Computer, you can Download latest version of Auto Mouse Click Software. How to use Switch between Admin and Non Admin Version of Auto Mouse Click. The Admin Version of Auto Mouse Click may be required for Automating Desktop Games or other Applications which require Admin Access when Launched. In case you do not have Admin Access to your Computer to Launch Version Selector, an Alternative way is also displayed in the Video. Watch Features at Glance Video Tutorial to Quickly Learn this Windows Automation Software. Given below are few Sample Script Video Tutorials which Display how to quickly get Started with Auto Mouse Click. Wherever possible the Sample Scripts are Provided for you to Download and Execute them. Create Simple Script which Clicks at different locations and repeats all the Script Actions 10 Times. Use Repeat Count for Action to execute a Single Action in Script Multiple Times. This Sample performs basic calculation on Calculator and then displays how to modify Action Repeat Count to execute a single action multiple times. Watch Click at 2 Location with Time Delay to learn how you can create a Script which Clicks at 2 Different Screen Locations with Time Delay in Between. In Order to add Time Delay to the Script a Mouse Move Action has been Added between the Script Actions (with Repeat Count more than 1). Add Time Delay between Actions by using the Move Mouse Action. This can be useful when you want Fixed Time Delay between Script Actions with Repeat Count greater than 1. You can write to Support@MurGee.com to request a Sample Script to fulfill your Automation Requirements.